Asia’s millionaires are on the rise and looking to optimise their investments. While the worldwide trend shows high net worth (HNW) individuals’ numbers are growing overall, the rise of Asia’s wealthy significantly outpaces the global average. 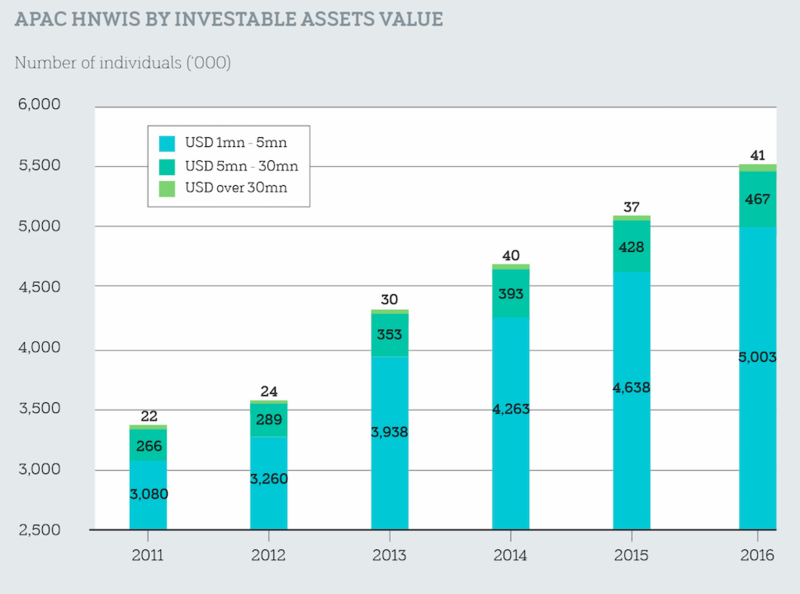 In just six years (2011-2016), Asia’s wealthy with investible assets of between $1-5 million – sometimes called the millionaires next door - grew by 353.7%, significantly outstripping the growth of HNW individuals with investible assets of between $5-30 million, whose numbers rose by 188.7%. In the same timeframe, ultra-high net worth individuals’ (those with investable assets of more than $30 million) grew by only 80.2%. Traditionally, individuals whose HNW is less than $5 million used their long-established bank relationships to provide investment options. But increasingly, the one-size-fits-all standard choices banks suggest don’t provide the returns these investment savvy, risk-adverse individuals seek when looking for higher, but diversified returns. But fund managers are paying closer attention to the wealth held within this sector, seeing the potential to aggregate small individual funds into larger investable products. Investment solutions that consider an individual’s aversion to risk and that also deliver higher returns than banks, is increasingly being found using fintech platforms that provide individual investors with the latest research, analysis and data. FinEX has operated in this space for two years and manages a $200 million fixed income portfolio connecting Asia’s investors with US assets; is licensed in Hong Kong, and its funds are registered in Singapore. It also focuses on private equity and real estate investment. Investment aggregation and risk profiling platforms like FinEX have a number of advantages for the $1-5 million HNW group. By pooling a number of investors’ funds and understanding each individual’s attitude to risk, the asset manager offers investors higher returns than standard bank solutions, such as term deposits. When matching risk profiles to tenors, FinEX Asia considers both individual and regional attitudes to risks associated with investing. “For example, Japanese investors are very risk-adverse, wanting to protect their principal while investors in Hong Kong and Singapore accept higher risks. So, when allocating returns we are able to cater to high liquidity investors with reduced risk appetite and low liquidity investors with higher risk appetite, to provide stable returns in an unstable climate,” Ng says. As an active manager, FinEX focuses on consumer credit (US consumer loans – equity and real estate and private equity (PE). Ng says in essence, PE is built on relationships and not the open market. It is therefore typically one area where the HNW individuals in the $1-5 million bracket are excluded. “Today there’s a lot of good PE investment but the number one problem is the ticket size is too high. For example, it’s well known that Singapore’s technology company Grab Taxi’s ticket size is $5-10 million,” Ng says. FinEX’s solution is to aggregate funds, matching a fund manager to HNW investors in the $1-5 million bracket, to create a pool of individual wealth plus institutional money. Since PE investment requires a high degree of domain expertise and knowledge in key areas such as risk management, compliance and sourcing, partnering also effectively spans capital entry requirements, financial analysis (macro and micro analysis), risk management and company onboarding, meaning clients are better informed about investments, a distinct plus given information dissemination is an ongoing issue within PE. Another reason why aggregation is important for Asia’s millionaires-next-door, is returns are increasingly being found within private, and not publicly listed companies. Milken Institute, a US-based independent economic think tank’s research within the tech sector shows a marked shift away from the public market to PE returns. In the 1980s, public market returns from companies like Microsoft and Oracle outstripped their PE returns, but by 2012 the majority of returns from Yelp and FaceBook went to PE. 2018 was a busy year for FinEX Asia, having completed deals in China, the US and southeast Asia. Given the current investment climate, those seeking returns in 2019 will increasingly need to be both agile and informed in order to take advantage of opportunities within Asia and globally. Easily assessible fintech platforms are likely to play an increasing role in providing the millionaires-next-door with the returns they seek, where ever these may be.